A kitchen worker from Horley has been charged with attempted murder after a Steyning man suffered knife injuries in Henfield on Sunday (April 19). Shane Elliott, 32, of Aurum Close, Horley, is to appear in custody at Crawley Magistrates’ Court today (Tuesday April 21). Police said he is charged with the attempted murder of a 29-year-old Steyning man who was sitting in his car parked on the Wantley Hill Estate, off London Road in Henfield, just before 6pm on Sunday. 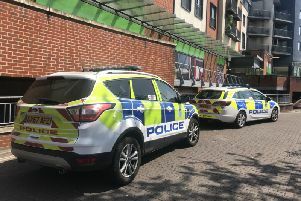 The Steyning man sustained serious knife injuries to his left arm and left hand, for which he is still receiving treatment at the Royal Sussex County Hospital in Brighton.